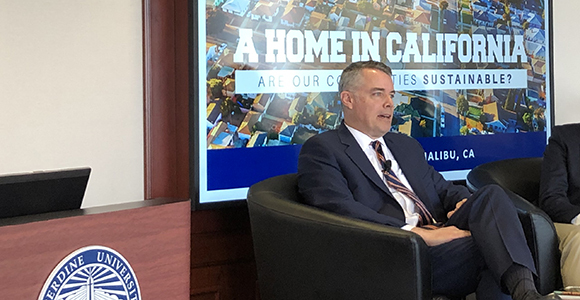 Those words from Leslie Appleton-Young, vice president and chief economist for the California Association of Realtors, at a housing conference at Pepperdine University Tuesday underscored the urgency of California’s housing shortage. The “A Home in California: Are Our Communities Sustainable?" conference attracted a couple of hundred participants from across the spectrum. California’s housing problem is well known. The state will need 3.5 million more housing units by 2025 and is nowhere near meeting that demand. Experts offered a long list of possible solutions, including bringing back redevelopment agencies, reducing abuse of the California Environmental Quality Act, better engaging communities to build political support, building more housing near public transit, strengthening regional governance and aligning state, regional and local government to coordinate technical assistance and funding. While that list is well established, and more than 180 bills have been introduced in the Legislature this year, most of the speakers expressed frustration at the lack of a coherent strategy. The conversations reverberated with the long standing tenant of local control over land use authority, with the growing anxiety that local actions are not adding up to an adequate solution. Alicia Matricardi, general counsel and director of real estate for New Economics for Women, said that unknown litigation costs and the high cost of permitting can kill a deal. California Forward CEO Jim Mayer, who moderated one of the sessions, asked the panelists what they wanted to see the Legislature do. If CEQA is so important, Mayer asked, why aren’t cities united and rallying to support changes that would reduce the CEQA abuse, which can block much-needed workforce housing. Jennifer Hernandez, a San Francisco attorney who has documented how CEQA is often used for non-environmental purposes, said those who exploit the law for personal reasons "hide behind the environment, while the people being hurt are browner, young and less healthy." The event was funded through the support of Fieldstead and Company whose CEO, Howard F. Ahmanson, emphasized the importance of dealing with housing at the local and regional levels. Even in parts of California that are considered more affordable, like Fresno, Riverside and Stockton, the housing price-to-income index is more than twice what is considered an optimum ratio. Rick Bishop, the executive director of the Western Riverside Council of Governments, noted that household income in his region is actually dropping, linking the importance of economic development and more well paying jobs as a key part of the solution.